Qiu et al. (2006) inferred land plant phylogeny of 193 species using 6 genes in the chloroplast genome, LSU rDNA in the mitochondria genome, and 18S rDNA in the nuclear genome. This revealed the above relationship with high statistical confidences. Another analyses using presence/absence of group II introns in 28 mitochondria genes and using 67 genes of the chloroplast genome in 36 species supported the inference. This was the most wildly supported phylogenetic inference (e.g. Shaw et al. 2011). Qiu , Y.-L., L. B. Li, B. Wang, Z. D. Chen, V. Knoop, M. Groth-Malonek, O. Dombrovska , et al . 2006 . The deepest divergences in land plants inferred from phylogenomic evidence. Proc. Natl. Acad. Sci. USA 103: 15511–15516. Shaw, A.J., Szövényi, P. and Shaw, B. 2011. 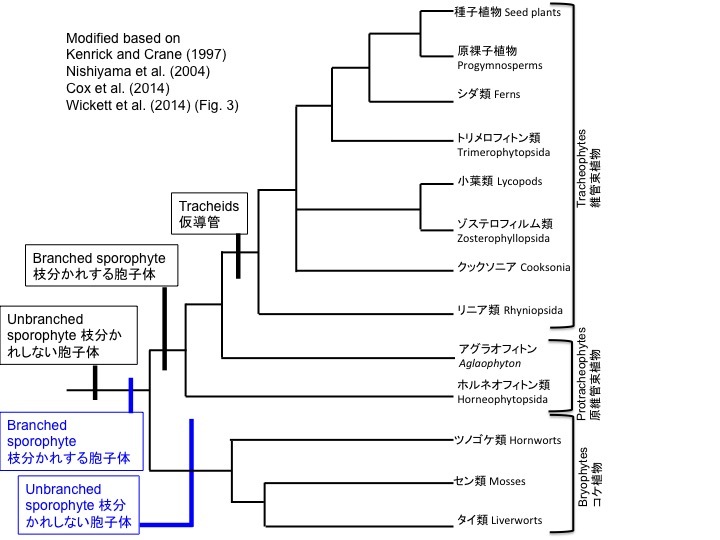 Bryophyte diversity and evolution: Windows into the early evolution of land plants. Amer. J. Bot. 98: 352-369. However, Cox et al. (2014) found that the results of Que et al. (2006) should be revisited because of the nucleotide composition biases of synonymous substitutions mainly observed in the 3rd position. Cox et al. (2014) justified using amino acid sequences or 1st and 2nd nucleotides instead of the 3rd used in Qiu et al. (2006). Furthermore, Wickett et al. (2014) analyzed nucleotides at 1st and 2nd codon positions with concatenated 674 genes or 424 gene trees with coalescent analyses. The former supported the hornworts basal in land plants (hornworts ((mosses, liverworts), vascular plants)) and the latter supported the monophyly of the three bryophyte groups ((hornworts (mosses, liverworts)) vascular plants). Since the concatenated gene analyses may produce incorrect trees with high confidence (Mirarab et al. 2014), here we cite the result of the coalescent analyses supporting the monophyly of bryophytes, which was originally proposed by the chloroplast genome analyses with amino acid sequences (Nishiyama et al. 2004). Cox, C.J., Li, B., Foster, P.G., Embley, T.M., and Civan, P. (2014). Conflicting phylogenies for early land plants are caused by composition biases among synonymous substitutions. Syst Biol 63, 272-279. Mirarab, S., Reaz, R., Bayzid, M.S., Zimmermann, T., Swenson, M.S., and Warnow, T. (2014). ASTRAL: genome-scale coalescent-based species tree estimation. Bioinformatics 30, i541-548. Nishiyama, T., Wolf, P.G., Kugita, M., Sinclair, R.B., Sugita, M., Sugiura, C., Wakasugi, T., Yamada, K., Yoshinaga, K., Yamaguchi, K., et al. (2004). 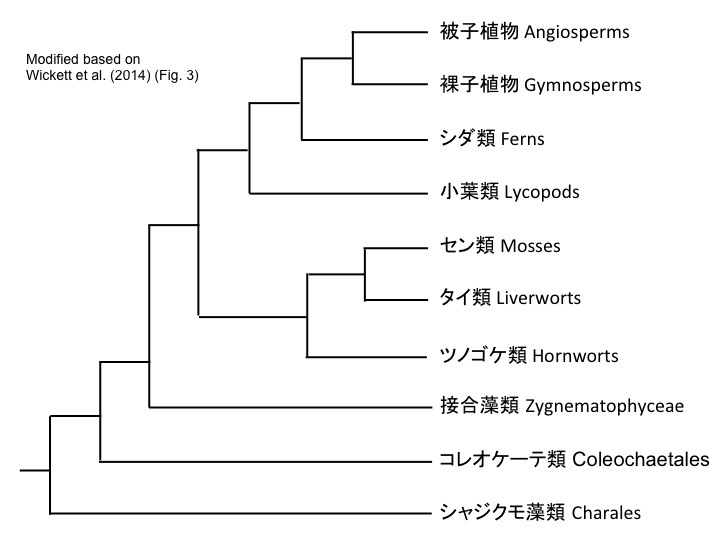 Chloroplast phylogeny indicates that bryophytes are monophyletic. Mol Biol Evol 21, 1813-1819. Wickett, N.J., Mirarab, S., Nguyen, N., Warnow, T., Carpenter, E., Matasci, N., Ayyampalayam, S., Barker, M.S., Burleigh, J.G., Gitzendanner, M.A., et al. (2014). Phylotranscriptomic analysis of the origin and early diversification of land plants. Proc Natl Acad Sci U S A 111, E4859-4868. Based on the gene tree showing the basal liverwort branching and the paraphyletic relationships of extant bryophytes, it has been widely believed that the common ancestor of land plants had unbranched sporophytes similar to extant bryophytes (Shaw et al. 2011), although sporophytes of bryophyte ancestors have not been identified in the Ordovisian and Silurian. 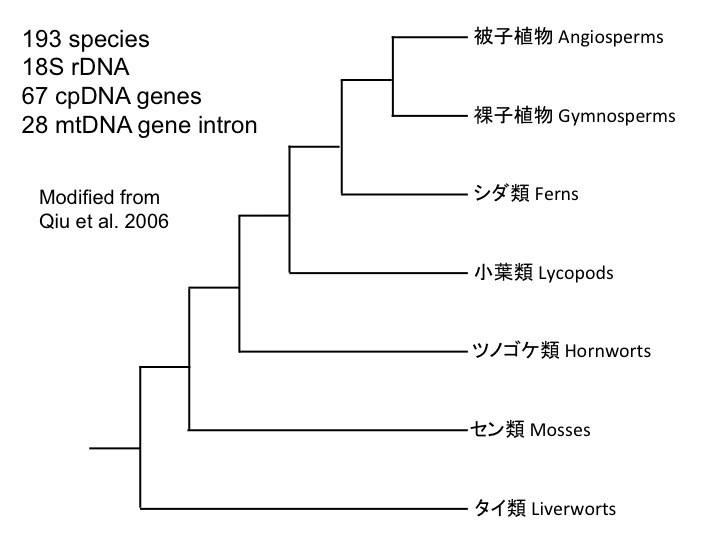 However, now it is revealed that the basal liverwort hypothesis is not supported, and we need to revisit the character evolution at the base of land plant evolution. The phylogenetic tree inferred by the Cladistic analyses with morphological data (Kenrick and Crane 1997) is merged with that of Wickett et al. (2014). It is equally possible to infer that (1) the common ancestor of land plants formed polysporangia at the tips of a branched sporophyte and reduced to monosporangium at the top of unbranched sporophytein the common ancestor of extant bryophytes (blue boxes in the figure) or that (2) the common ancestor of land plants formed a monosporangium and evolved to form polysporangia in the common ancestor except extant bryophytes (black boxes in the figure). Because of the abundant polysporangiate fossil records in the upper Siluriand and the Devonian, it appears to be more plausible to infer that the common ancestor of land plants were polysporangiate as shown by the blue boxes in the figure. Shaw, A.J., Szovenyi, P., and Shaw, B. (2011). Bryophyte Diversity and Evolution: Windows into the Early Evolution of Land Plants. Am J Bot 98, 352-369. What genes were involved in the evolution of branched sporophytes? Okano et al. (2009) found that the deletion mutant lines of CURLY LEAF (CLF) formed apogamous sporophytes with indeterminate growth with indeterminate stem cell activity and the apogamous sporophytes branched with de novo formation of stem cells. CLF is a component of the polycomb repression complex 2 (PRC2), which regulates histone H3 K23 trimethylation. Deletion of another component of PRC2, FERTILISATION INDEPENDENT ENDOSPERM (FIE) also resulted in the similar phenotype (Mosquna et al. 2009). These results show that Physcomitrella sporophytes can be branched by the change of chromatin modification by PRC2, suggesting the involvement of PRC2 changes for the evolution of branched sporophytes in land plants. Furthermore, Induction of CLF in the mutant terminates the stem cell activity and forms a sporangium at each top of branches. Therefore, sporophytes grow without CLF activity and stop to grow with CLF. 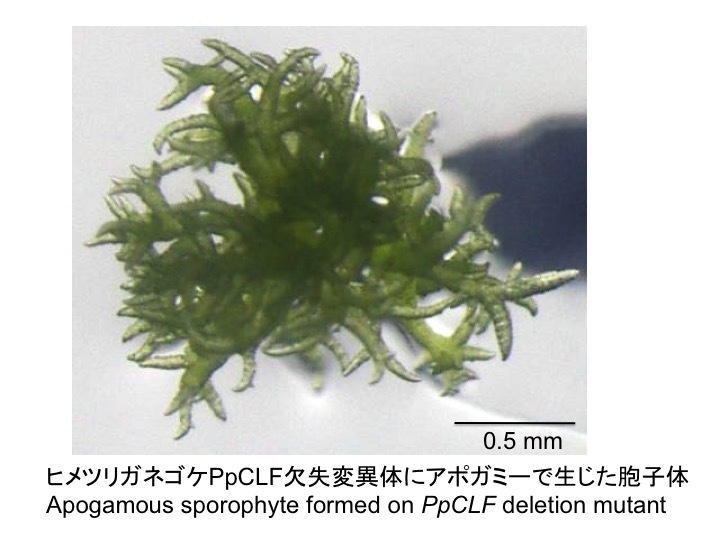 This indicates that the regulation of CLF changes the size of sporophytes. During the evolution of land plants, the size of sporophytes became larger. Together, the evolution of the regulatory mechanisms of CLF appears to be related to the evoluton of sporophyte enlargement in the land plant evolution. The branched clf sporophytes are similar to the extinct protracheophytes, such as Horneophyton. When we can reveal the developmental mechanisms of the branched mutants, such knowledge will be useful to revisit the evolutionary process of fossil plants. Mosquna, A., Katz, A., Decker, E.L., Rensing, S.A., Reski, R., and Ohad, N. (2009). Regulation of stem cell maintenance by the Polycomb protein FIE has been conserved during land plant evolution. Development 136, 2433-2444. Okano, Y., Aono, N., Hiwatashi, Y., Murata, T., Nishiyama, T., Ishikawa, T., Kubo, M., and Hasebe, M. (2009). A polycomb repressive complex 2 gene regulates apogamy and gives evolutionary insights into early land plant evolution. Proc. Natl. Acad. Sci. USA 106, 16321-16326.